In the last years, cmder became my default console when I needed a cmd.exe-compatible Windows console. 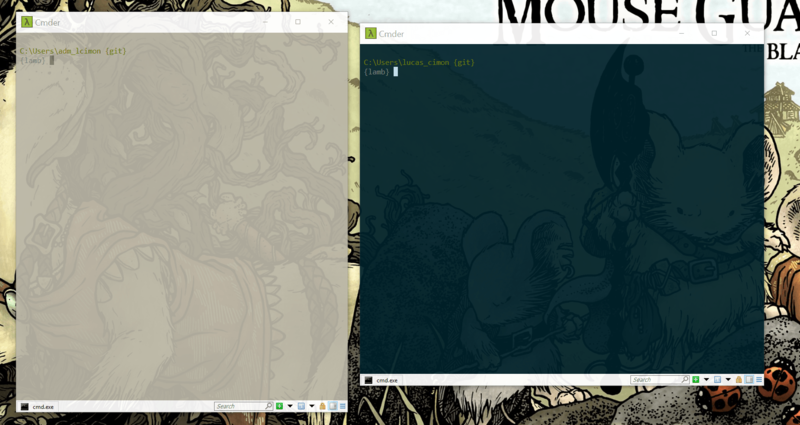 Hence I decided to find a way to change the palette when in an admin cmder console. Notice that the name of the ConEmu configuration file (the underlying console emulator used by cmder) is ConEmu-%USERNAME%.xml. Now, in the config/ sub-directory, make a copy of the default ConEmu.xml file for every user you want to launch cmder as and name like that: ConEmu-%USERNAME%.xml. Finally, launch cmder as admin, right click on the title bar of the window and choose "Settings", go to "Features > Colors" and choose another palette, like "Solarized Light". "Save settings" and you're done !